Significant consideration goes into choosing a name whether it is for a child, a pet or a business. This is because a name reflects the identity of that person or thing being named. Usually, when naming a child, the name is chosen either based on the current circumstance of the parent or it reflects their projected future fortune for the child. Also, the child may be named after a person that the parents aspire their child to live up to. That name is expected to remains with the child forever, hence parents usually take time to get this right. The same applies to business names. Of course, businesses are known to change names after they are launched but this is usually costly. Choosing a name that encapsulates an entire business is not an easy task. There are companies that can help you to achieve this objective, but they charge thousands (if not tens of thousands) of dollars. It is safe to assume that most start-up businesses cannot afford such expense. Hence, XEED brings you this guide which provides simple steps that would help business owners choose their business name. This may be is an exaggerated example. However, it illustrates the challenge that the company is likely to face when looking for a name that reflects its range of businesses. The first step is therefore to ensure that the objectives of the business are clear. For example, the key objective for XEED Business is “To support entrepreneurs through the start-up stages of their business in order to ensure their business success”. Once the objective(s) of the business are clear, it is advisable to gather a number of key business associates for a brainstorming exercise. These should be people who know about the business such as the directors, business partners and/or family members who have been part of the idea incubation process. The objective of this step is to identify keywords that reflect the essence of the brand. To structure this exercise, we recommend using the following model called the Brand Wheel. This model is used to describe a brand (and a business) under 5 main headings. Attributes reflect the key physical and factual elements of the business. This could include where the business located, its target segment, key features of its product/service etc. It could also include the owners’ names(s). Attributes could be: "Agnes, SME, Ibadan, Ultra-fast, Mobile App" etc. Benefits reflect the tangible elements of the business that make it stand out from its competitors. This will usually be the reason why a customer would choose the business or service. It may include "Affordable, Exceptional customer service" etc. 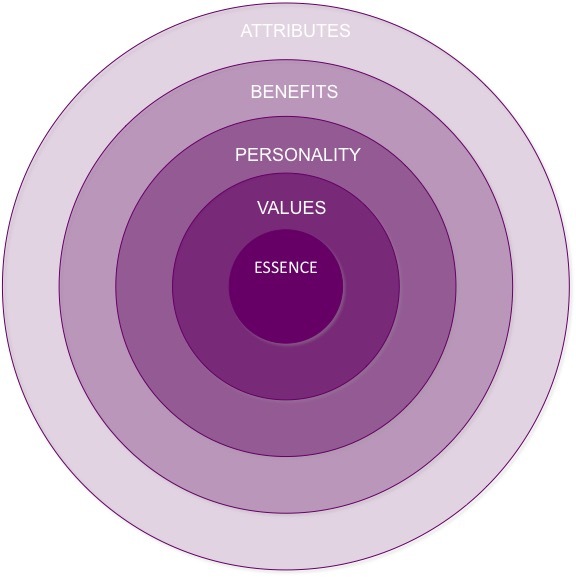 Personality: As with all individuals, every business has a set of personalities that reflect how external people describe the behaviour and approach of the person/organisation. The personalities of the computer giant Apple include Bold & Innovative. Values are usually internally focused and reflects what the organisation aims to stand for; it encompasses the company's moral standards, code of behaviour, rules of conduct. This may include words like "Diversity, Supportive, Accountable, Ethical" etc. Essence reflects an emotional idea or intangible benefit that is core to the company’s offer to its customers; how the company expects its customers to feel. One example is the company Disney, which has a brand essence of ‘Magic’. These elements combine to reflect the business. It is as though one has painted the picture of the business in words and the identity of the business is clear if the picture captures all key brand elements. In the previous step, we discussed that elements of the brand essence paints a picture depicting the business. However, oftentimes only key features are required in a picture in order to identify the person. A gap in the teeth, the skin colour, their voice, their smile, etc, these are all key elements. Therefore, from the original list of words, the next step involves prioritising a few words that strongly reflects the essence of the business. Again, this should be done in a group session. Some words will stand out more than others. For example, describing a person as having arms is very generic and does not differentiate one individual from another. However, if that person is described as having extra long legs, this will differentiate the person from others. This is the purpose of picking out the keywords. At the end of this process, there should be white board with a good selection of keywords and associated words. Now we have the foundation for choosing a business name. In Part 2, we will continue with creative ways to use these to developing the business name. Whether your start-up journey had a different or similar experience to ours, we would like to hear from you.